Vulcan is usually pretty good about putting thought into the default settings. Creating a triangulated surface is no exception, selecting the default settings will create a simple, standard triangulation. After clicking the ‘OK’ button you will be prompted to select the data to triangulate. 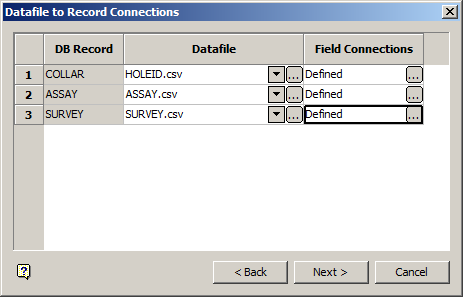 Select the data to triangulate (usually by layer or group) and cancel out of the ‘Select By’ panel. Condition – this option prevents the formation of certain edge triangulations. These manifest themselves mainly as vertical walls at the edge of topography, effectively making your surface into a bowl. Select ‘Maximum edge length’ and enter a value of the longest edge triangle side that is allowable. This value will vary from surface to surface but in a mine design it is unlikely that it will be less than 100 feet or meters. Been looking for a site like this for yrs Anthony, I've been using Vulcan for mine planning/ design for 6yrs now and wondered about doing a similar posting excercise. I can't understand also why there are no known books out there with simplified procedures, for instance I've just been doing some pit optmiser runs for new mines and the help is somewhat unhelpful. Grids/ Advanced Res/ Block modelling all need a simple idiots guide type book. Thanks for the feedback. I think it's time for Vulcan users to become more independent of Maptek. Help guides written by users, for users are always going to be better than the ones written by sellers. I am working on simplified guides for things like Grids/Advanced Reserves/Block Modeling as time permits. Any input you would like to give (on Pit Optimiser for example) would be greatly appreciated. Nice Post!!! MBA refers to Master of Business Administration and a student who competes this course is able to apply to several management positions in almost all the companies available in the modern world.So it become the necessity for the youths. And Mumbai is the best place for it. The Indian School of Management Mumbai Courses are considered as the courses with vast syllabus. As it also include the practical knowledge of management.